The Leaders in Building Commercial Grade Airboats! We build the strongest and safest airboats in the industry to handle your toughest jobs! With over 48 years of experience in airboats, American Airboat Inc. offers new airboats and used airboats for sale, airboat parts and a complete airboat service department. Home of the AirRanger Airboat. 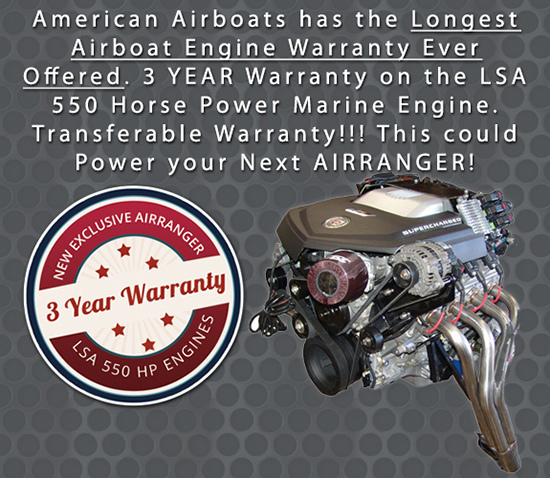 Lifetime hull warranty & 5 year warranty on stainless steel make American Airboats the leader in the airboating industry. LARGEST SELECTION OF PRE-OWNED AIRBOATS IN THE AREA! At American Airboat Corp., we successfully sell pre-owned airboats for our valued customers in a very fast, efficient, and professional manner for all parties involved. Every single used boat that comes through our shop is thoroughly inspected by the top professionals in the airboating industry upon arrival, making certain that the airboat is up to standard for an excellent experience for the buyer and seller. airboat training with the help of American Airboat Corp. AirRangers! Another fantastic #AirRanger out the door, this one headed up to our friends at Airboat Alaska. Hopefully all those Alaskan tour groups can take their eyes off this boat long enough to take in the sights! The 2017 Muzzy Bowfishing Tournament is in the books. John Paul Morris and Mark Land put on an Awesome event! Team TKO won 1st place representing for American Airboats in the Thrills and Kills AirRanger! 2 AirRangers to the Rescue! Two women in a kayak went over the wing dam south of the New Hope-Lambertville free bridge across the Delaware River at around 1:45 p.m. Thursday.